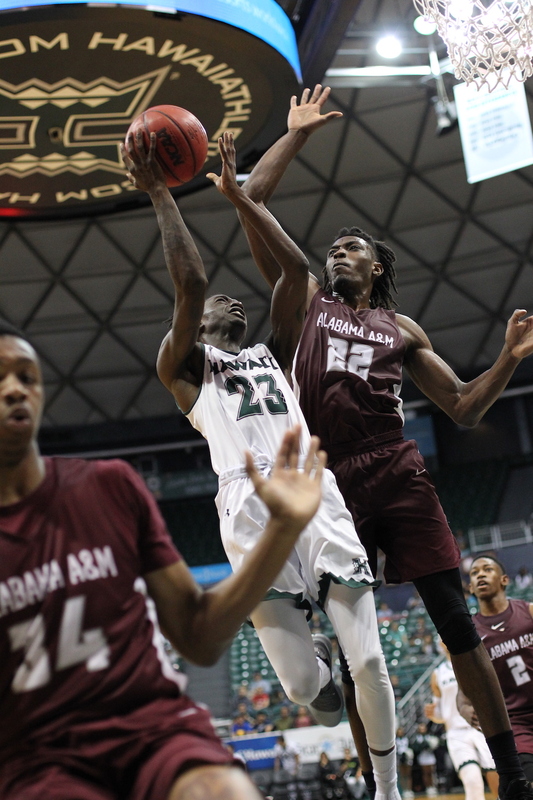 Proving once again that in this 2018-19 season, victories shall be earned — not given — Hawai’i held off upset-minded Alabama A&M, 71-63, in its surprisingly competitive non-conference finale Saturday night. A sparse-but-supportive crowd of 2,790 at the Stan Sheriff Center watched Eddie Stansberry score a season-high 26 points — including 17 in the first half — and Zigmars Raimo add 14 points and seven rebounds as the Warriors improved to 9-5 entering Big West Conference play in the new year. Tre Todd scored 18 points and Jalen Reeder added 12 points to lead the Bulldogs, who fell to 1-12. 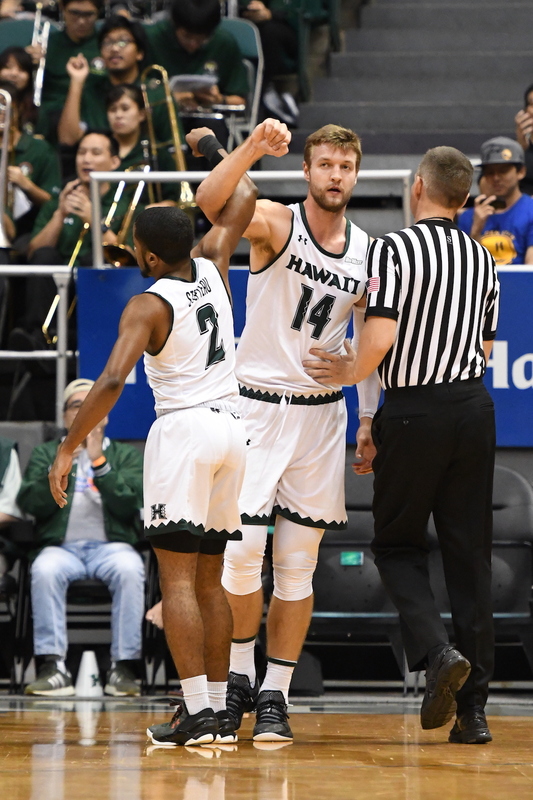 “Pleased with the win, and fortunate to win this game,” UH coach Eran Ganot said. “Give (the Bulldogs) a lot of credit, they had been playing well coming in. They out-scrapped us — a key part of the game was taking care of the ball, and we turned it over 18 times, 12 in the second half. We tried to prepare for a zone (defense) we hadn’t seen, and obviously didn’t prepare well enough. We were a little bit sloppy, soft with some passes, not getting to the right spots, and then at key times when we could have separated, but made some home run passes or home run plays. For most of the game, Alabama A&M did not play like a 1-win team. The Bulldogs torched the nets from 3-point range in the first half, swishing 8 of 14 attempts (57.1 percent) including an improbable bank shot from the left wing by Todd to put them ahead, 34-26, with 3:50 remaining in the first half. UH responded with an 8-0 run to tie it up at the break, 34-34. “On film they looked like a very scrappy team, and we’ve got to give them a lot of credit,” said Stansberry, who made 6 of 9 field goals himself in the first half, including 4 of 5 from beyond the arc. “They were making some big-time shots in the first half, our defense wasn’t there at first, and we knew that. We tried to make adjustments, and tried to make them take tough shots. But they were making tough ones as well, and so that kind of threw us off a bit. We just had to get back to our principles on defense, and stay solid, and hopefully those shots wouldn’t fall in the second half. The Warriors finally took the lead for good on Raimo’s layup off of Jack Purchase’s nifty no-look pass six minutes into the second half, and eventually extended it to 63-52 after Purchase sank a jumper from the right elbow with 4:57 left. 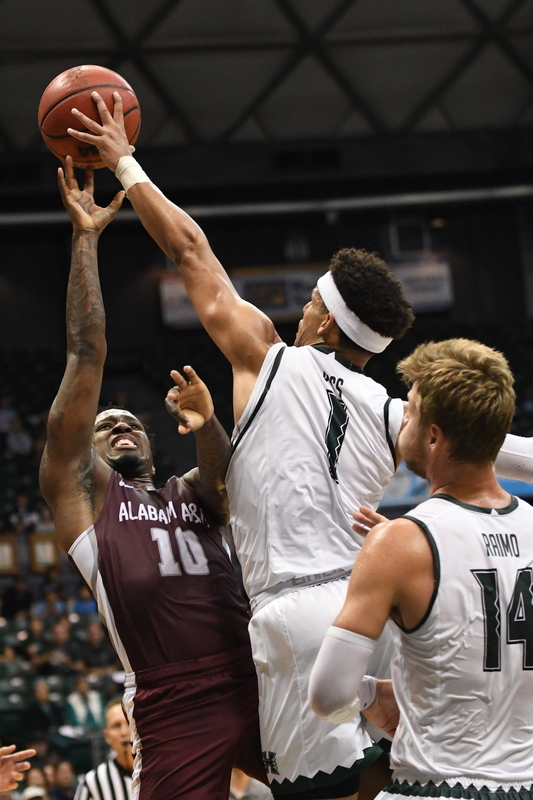 But Alabama A&M wasn’t finished, and mounted one last rally that pulled it to 63-61 after Walter Jones’ jumper from the right baseline with 1:51 remaining. Stansberry then answered with a three-point play with 1:16 left to make it 66-61, and after Reeder closed it to 66-63 with two free throws at the 1:04 mark, Purchase and Drew Buggs combined to sink five of six free throws down the stretch to seal the victory. Senior guard Sheriff Drammeh, who did not see action in the previous two games, came off the bench in the second half to contribute seven points, two rebounds, two assists and one steal off the bench, in addition to taking a charging call. “It was good to see — he’s done a good job over the last couple weeks, he’s worked his way back,” Ganot said. “He hit big shots, I thought he defended well, his energy was needed at the right time … He’s been a great teammate during the last couple weeks, and one of the things you’ve got to have with a good team is everybody’s got to be ready to go when your number’s called, and it’s a credit to him to not play in the first half, and then come in the second half and give us a huge lift. The Bulldogs’ hot shooting did cool off in the second half, as they made just 2 of 12 attempts from 3-point range. 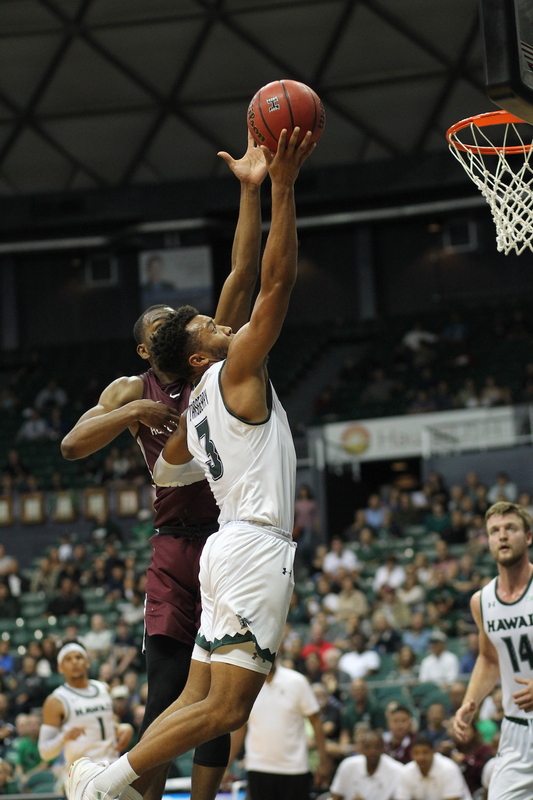 But overall the hard-fought victory was a glaring reminder — just as a closer-than-expected 82-75 win over visiting UH-Hilo was on Dec. 8 — that this season will not see any “easy” victories, if there is such a thing. The Warriors now have 10 days to prepare for the Big West opener at home against Cal State Fullerton — 10 days that they need in order to make significant improvement, Ganot said. UCLA fired coach Steve Alford. They looked pretty darn good against UH but I think something happened after that and they been losing a lot. Hulland looked really good against UCLA. All that length on those drives, looked like UCLA couldn’t contain him, (back when UCLA was playing well). A bit like Noah Allen on those drives. Hulland should work on his passing off his drives and his midrange game. Now that you mention, I am wondering why Hulland has not played that much ever since that game. Some people were talking about putting him in the starting lineup. If I was the coach and had three 7″ freshman, I would find a few min. for all of them every game, and keep them interested in the program. Yes, i see 1 or 2 transferring if they don’t get more playing time.